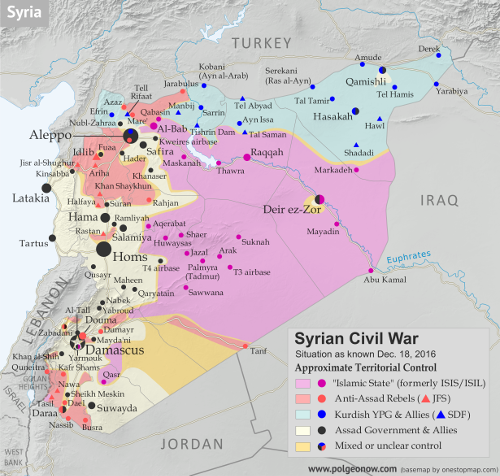 The rebel control maps in this article were produced for PolGeoNow's professional conflict map subscription service. Full-size versions of all PolGeoNow conflict maps, along with territorial control timelines, are accessible to subscribers. You can learn more about our map subscriptions here. Non-subscribers can also view our collection of free sample control map reports. Syria, Iraq, and the "Islamic State"
The Syrian Civil War continued to be the biggest armed conflict in the world through 2016, as well as a prominent example of a country whose territory isn't all controlled by the recognized government. During the past year, pro-government forces scored some major victories against the rebels, recapturing the country's second largest city and gradually increasing control in areas around the capital. 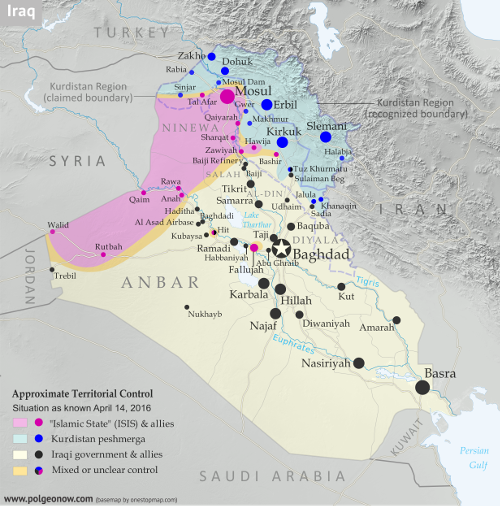 Meanwhile, the so-called "Islamic State" (IS; formerly ISIS/ISIL) lost ground in Syria throughout the year, getting cut off from its border with Turkey by Turkish-backed rebels, and driven from important northern towns like Manbij and Shadaddi by the US-backed Syrian Democratic Forces (SDF), a coalition led by Syrian Kurdish militias. IS also lost the southern desert town of Palmyra to government forces, but recaptured it again before the end of the year. 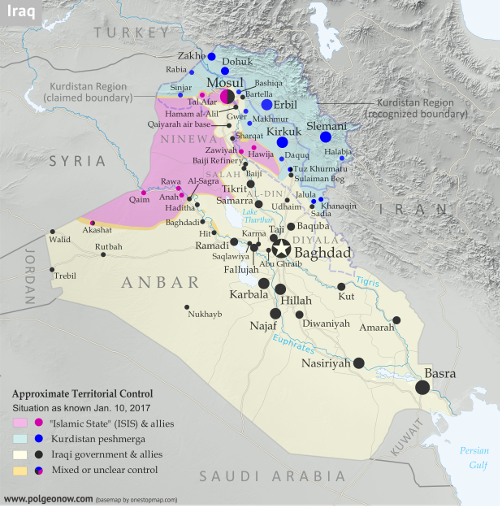 At the other end of IS territory, in Iraq, the group also suffered territorial losses, being driven from its earliest Iraqi strongholds in Fallujah and Ramadi, while losing nearly half of its biggest city, Mosul. 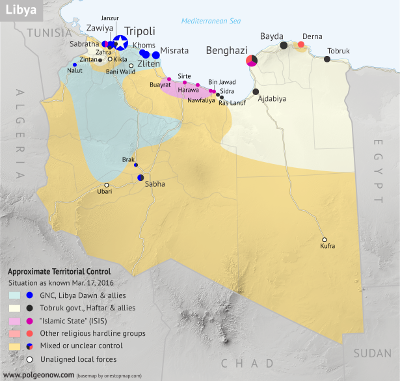 IS also had a disastrous year in Libya, where it fell from its greatest extent of control in early 2016 to holding no territory at all by the end of the year. Elsewhere in the world, IS struggled to gain territorial footholds in Somalia and Yemen, but had little to show for it at the end of the year, while Nigeria's IS affiliate - commonly known as "Boko Haram" - spent 2016 with little to no territorial control, after being decisively driven out of most of its possessions in 2015. And while IS was beginning to accumulate territory in Afghanistan a year ago, by mid-2016 it lost most of it again to government offensives and conflicts with the Taliban rebels. Meanwhile, all of the countries where IS struggled to hold ground - except for Nigeria, where other rebels' attempts to capture land fizzled out - had bigger territorial control issues. 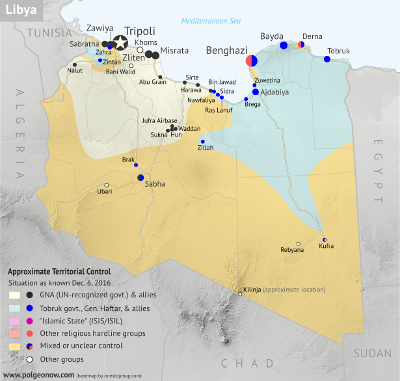 Libya saw a major political realignment between its two rival governments, as the internationally unrecognized administration in the west joined a new UN-backed unity government, leaving its rival in the east to lose much of its international support. Control on the ground also changed late in 2016 after a power struggle over independently-guarded oil ports on the country's central coast. In Afghanistan, the Taliban continued consolidating their control of rural areas, while briefly overrunning or besieging three provincial capital cities. Around the middle of the year, 20% of Afghanistan was reportedly under Taliban control. At the same time, Somalia continued to struggle against Al Shabaab, an affiliate of Al Qaeda, which continued to control a large portion of the country's rural south, and briefly overran some major towns in 2016. In Yemen, meanwhile, a Saudi-backed coalition nibbled slowly at the edges of the territory of the Houthi rebels now in control of the country's capital, finding more success driving Al Qaeda forces out of several cities and towns along the country's southern coast. The ACLED conflict database catalogued heavy ongoing territorial struggles in South Sudan, Sudan, and the Democratic Republic of the Congo, a handful of small rebel seizures or losses in Mali, Myanmar, Thailand, and Mozambique, and possible incidents of rebels capturing bits of territory in Ethiopia, Uganda, and Kenya (where Al Shabaab violence sometimes spills over from neighboring Somalia). Pakistan also reportedly cleared one of its last areas thought to be held by religious hardline rebels near the border with Afghanistan. 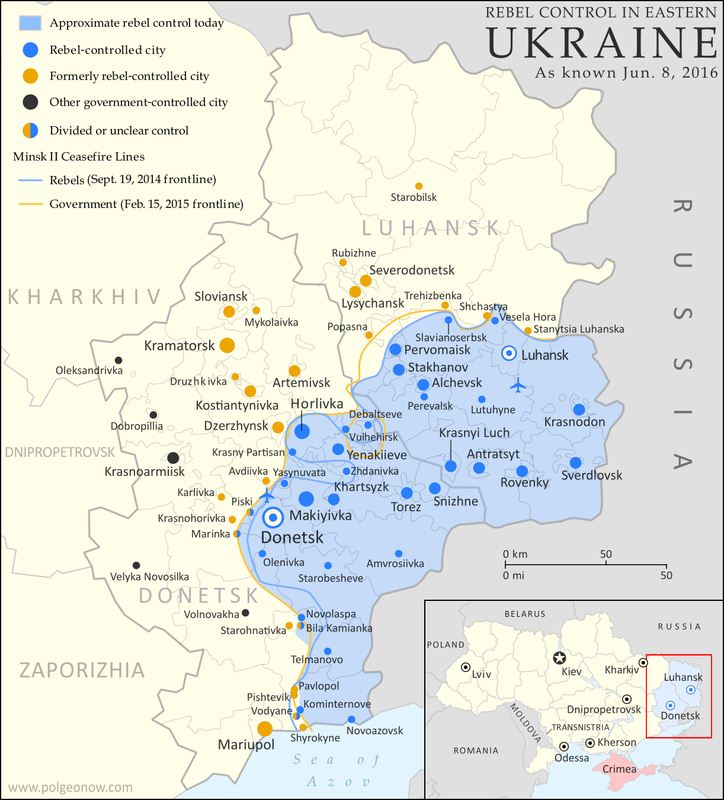 PolGeoNow also reported on some small changes to territorial control in the nearly-frozen conflict between Ukraine and the breakaway Donetsk People's Republic. Meanwhile, news reports indicated that rebels briefly stormed an Indian military base in the disputed Kashmir region, while a blossoming insurgency in Nigeria's Niger Delta region (far away and separate from the war with "Boko Haram") saw rebels allegedly attempt to capture a town near the country's largest city. Late in 2016, Colombia's FARC rebels began laying down their weapons after a peace deal was reached to end the country's 50-year civil war. PolGeoNow hasn't been able to find proof of exclusive FARC control of territory in recent years, but reporting on the deal did make reference to FARC-controlled areas. Though not exactly rebels in the usual sense, other armed protesters used small territorial occupations to express their grievances in 2016. One group took over a police station in Armenia's capital for two weeks, while another seized a wildlife facility in the US state of Oregon for over a month.